Responsible pet owners want to be prepared for the costs of veterinary emergencies, either with veterinary pet insurance, or with savings set aside for that purpose. 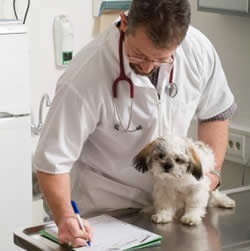 However, veterinary emergencies often happen when least expected, and job loss, family illness, or other financial crises sometimes come in tandem with those veterinary emergencies. Pet health insurance, like other forms of insurance, is a gamble. You're betting your pet will need it, and the company is setting odds that it won't. There are a number of factors to consider before purchasing pet insurance. You may in fact decide against it, depending on your situation, and your willingness to gamble. Unlike human health insurance, most pet insurance companies require you to pay the entire veterinary bill at the time of service. You as the owner are then responsible to send itemized bills or invoices from your veterinarian to the pet insurance company for reimbursement of qualified costs. Some basic plans start at $10.00 a month, while more extravagant plans cost upward of $400.00 a month. Since no two pet insurance plans are exactly the same, you should research each policy before making a choice that best fits your needs. Look over several plans from different companies before making a provider selection. Make sure the plan you choose defines clearly what is and what is not covered. For some pet owners, pet insurance is a safeguard for future catastrophes, such as sudden accidents or the emergence of a serious illness or cancer. For others, the coverage they choose applies to every vet visit. Fortunately some companies offer a variety of plans, depending on the needs of your pet. One company even provides a policy specifically for senior pets. Another has a plan for accident coverage only. Riders are also available for dental, extended cancer coverage, or preventative care (vaccinations, etc.). You might be able to save on premium costs through picking and choosing the plan that is right for your pet. There is more to picking insurance plans than finding out what is covered by insurance. You need to also know what is not covered so you can compare plans to one another and so you are prepared when your pet needs a test or procedure that is not covered. All pet health insurance policies have exclusions. One of the most common is the "pre-existing condition" which is defined loosely as injuries, medical conditions and symptoms of concern that were evident prior to enrollment in the insurance plan. In other words, you can't wait until your pet gets sick and then apply for insurance hoping to cover your expenses. Are hereditary illnesses and conditions covered? If you own a purebred animal, they may be prone to a breed specific condition. For example, German Shepherd’s are likely to develop hip dysplasia, and Labrador’s are often inflicted with eye problems. It is important to understand if hereditary conditions or congenital conditions (conditions present since birth) are covered by your plan. What's the deductible? is there a co-pay? Be sure to understand what you are expected to pay for and exactly how much. You don't want to pick an insurance that covers little if anything. Keep in mind most insurance companies will only reimburse a percentage of your actual veterinary bill cost. What (if any) is the age limit for a pet to be covered? The best time to purchase pet insurance is when your pet is just a puppy. As pets get older they require more care, especially later in their lives, and the premium can increase or coverage no longer exists. So who is pet insurance for? Many dogs can live long, healthy, accident free lives today, but no owner can guarantee their canine companion will never have an accident such as eating a sock, swallowing a rock, or even getting hit by a car in the driveway. These are the situations where pet insurance can be very helpful. Unfortunately, you have to decide if the benefit of the insurance is worth the yearly expense. What pet insurance companies are available? Please research each pet insurance company you consider, to make sure it offers the right plan for you and your pet. Merrick Veterinary Group does not endorse one particular insurance plan. Each and every insurance carrier has its pros and cons, and every pet owner needs to decide which carrier (if any) is the best one for them and their pets. We would be happy to provide you with answers to your questions and to discuss veterinary insurance with you at your next appointment. Please call (516) 379-6200 to make that appointment today.